SARATOGA, Wyo., Feb. 28, 2014 – The Bureau of Land Management Rawlins Field Office has recognized The Overland Trail Cattle Company LLC for its environmental stewardship and range management initiatives across three BLM grazing allotments that TOTCO manages in Carbon County. Citing TOTCO’s significant investments in range and water improvements on the Overland Trail Ranch, the BLM office said all three allotments meet all six Rangeland Health Standards. The 320,000-acre Overland Trail Ranch – which consists of privately owned land interspersed with federal- and state-owned parcels in the checkerboard – also was recognized for “extensive cooperation” with BLM and other agencies over the years. 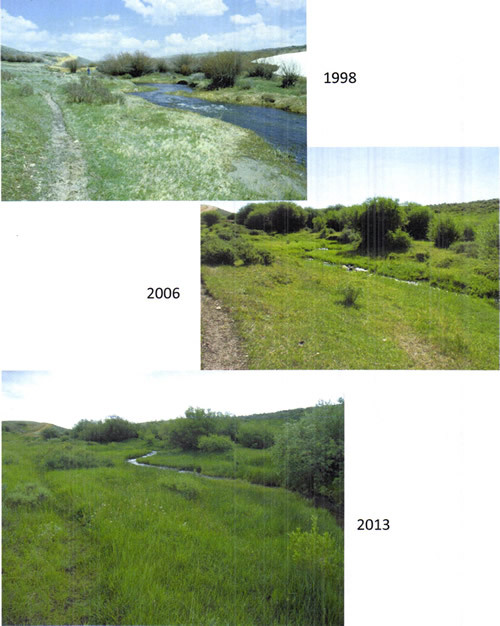 In the Pine Grove/Bolten allotment, the BLM noted that TOTCO has worked with federal, state and local agencies to implement best management practices to improve riparian habitat condition and reduce sediment in Lower Sage Creek. As a result of this “cooperative landscape effort,” in 2008 the State of Wyoming removed Sage Creek from its list of impaired waters. McKinney Creek, which flows through both the Pine Grove/Bolten allotment and the Grizzly allotment, also was recognized for improvement. 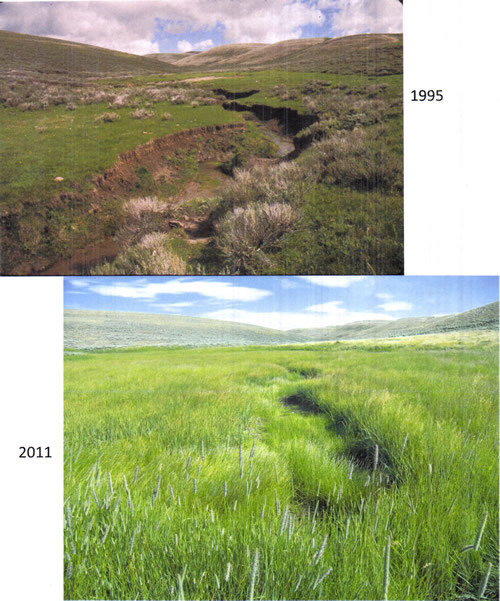 In the Sage Creek allotment and Sixmile Hill allotment, the BLM said that prior to TOTCO management, riparian conditions at the headwaters of Fish Creek were determined to be “functioning at risk.” Thanks to TOTCO’s careful management and rotational grazing techniques, the 2012 riparian assessment reported all ratings on Fish Creek had improved to “properly functioning condition.” The 2013 field assessment of the rest of the allotments found similarly improved conditions. In addition to its work with BLM, TOTCO has been collaborating with Power Company of Wyoming LLC to bring responsible wind energy development to portions of the ranch. This partnership has led to multiple wildlife conservation measures being implemented across the ranch, such as marking, removing and replacing fencing to reduce wildlife collision risks; installing wildlife-friendly water tanks; reclaiming ranch roads to reduce habitat fragmentation; and creating a mosaic of vegetation types and quantities to support various wildlife and their differing habitat needs.